Wondering why there's flying in Anthem? Here's why BioWare included it in the game, and how it was to impress a muckety-muck at EA. 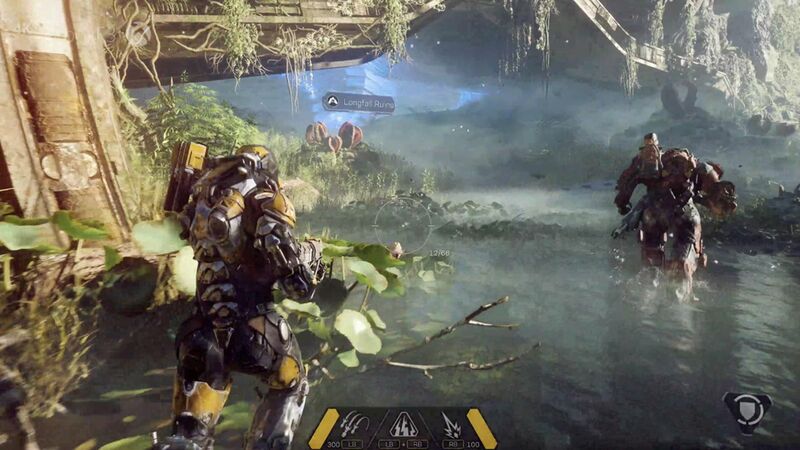 Anthem could have been a much different game, according to a new report from Kotaku. The lengthy Anthem piece explores much of what the game would have been like if a massive amount of changes hadn't been made – including its name, which was "Beyond" only a few days ahead of its E3 2017 debut. One interesting tidbit from the interview with over 19 people involved with the game's development is the fact that one of the most popular features of the game, the ability to fly, wasn't a sure bet at first. It was added and removed a few different times, and in 2017 it wasn't set in stone. Those close to the game claim that it was put back into the game weeks before E3 ahead of a seemingly disappointing demo for EA's Patrick Soderlund. "The demo was not actually built properly. A lot of it was fake, like most E3 demos," one developer mentioned. "There was a lot of stuff that was like, 'Oh are we actually doing this? Do we have the tech for that, do we have the tools for that? To what end can you fly? How big should the world be?'" It's interesting that so much of such a massive game could change like this in such a short amount of time, but that appears to be precisely the case with Anthem as it undergone several transformations before the final product hit store shelves. Perhaps that could explain the game's rocky start, and the various issues fans had been having with the title since it debuted. Whatever the case may be, this is a fascinating story that brings several facets of Anthem to life. My biggest takeaway from Anthem is that it's yet another heavily-hyped game with a lot of promise that has a good chance of being awesome in its second year. Anthem's teases for the future, including the one that comes after defeating The Monitor, do look enticing. But I'm not looking for Anthem to be its best game in Year 2 or 3. I'm looking for Anthem to be a good experience now. And like Destiny, like No Man's Sky, like Fallout 76, like The Elder Scrolls Online, Anthem could be a great game by next year. But that doesn't make it a good game now. Right now, Anthem is not good. And given what's come out of BioWare in the past and the kinds of lasting, impactful experiences that the gaming world knows BioWare is capable of delivering, that's truly sad.